Darkness Calls is the second book in the Hunter’s Kiss by Marjorie M. Liu, and I would like to tell you about the plot, but I honestly can’t! I don’t mean that to sound mean, and I’m conscious that it comes across as extremely negative – but I found Darkness Calls a tough read in terms of comprehending what went on. From what I can tell, a new Avatar is on the scene and wants to take control of the power wielded by Grant, Maxine’s partner – who happens to be some kind of immortal Lightbringer (something that is never quite explained). It ties into the story started in the first book as the veil between Earth and the demon prison begins to fail, but this novel takes you through time and space, and introduces many supernatural elements. I didn’t like it. And yet I did. Marjorie M. Liu writes a sharp story, with absolutely beautiful prose, but I’m not quite comfortable on the journey. I don’t know where she’s going. I don’t know what she’s doing. I’m not even sure about the characters! As an example of my confusion, take the relationship between Maxine and Grant. When we first met them in The Iron Hunt, they had already been together for a number of months, but we never actually saw the start of their relationship (I believe it is detailed in a novella by Liu). On one hand, I enjoy that, because it is fairly unique in paranormal fantasy. On the other hand, I seriously dislike it because I have no investment in their love – I didn’t see why Maxine chose Grant. I didn’t see why she decided to reveal her big secret. For me, this makes the relationship feel empty and therefore I don’t understand why Maxine is willing to risk life and soul for this man. Another aspect of the characterisation I find tough is that everyone seems to have some kind of secret power. We haven’t met anyone who is normal – for me, this makes it hard to care about them. We see Avatars, Wardens, zombies, demons, Lightbringers – where are the everyday people who usually inhabit a tale such as this. It just adds to the clinical feel of the novel. The emotional heart to the book was Maxine, and I genuinely enjoyed her confusion about her role and her conflicting desires to follow her mother’s path and to stay in Seattle with Grant. I mean, I didn’t enjoy the fact she was so torn, but Liu wrote it wonderfully and I would have liked to see much more of this, rather than the supernatural elements that imbued Darkness Calls. In The Iron Hunt we veered a number of occasions into odd, dreamlike segments that seemed to come out of nowhere – in Darkness Calls this happens more often and hence my enjoyment in reading Liu’s wonderful prose lessened. 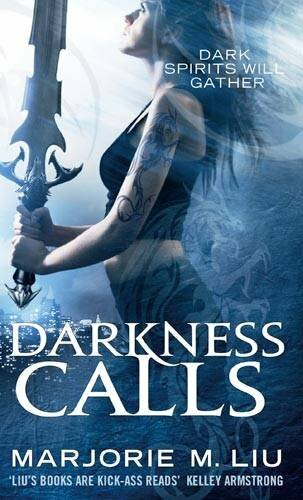 So, overall, I firmly did not like Darkness Calls, but I am desperate to see what Marjorie M. Liu could do with a decent story. This review appeared originally on www.fantasyliterature.com and parts of it were used in a trilogy review in Vector magazine.